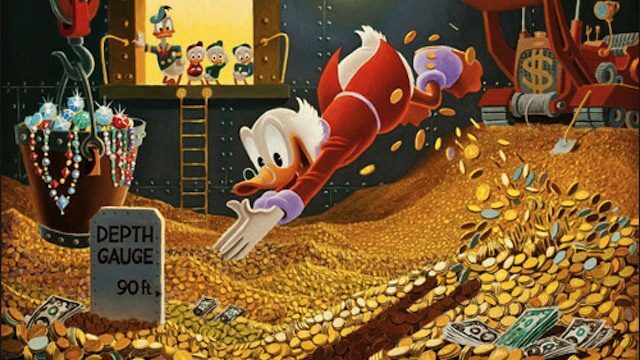 Once you’ve successfully valued your business, feel free to celebrate with a nice Scrooge McDuck-style money bath. Q: How can I better manage my cash flow? A: We get it, as a business owner you need your focus to be on growing and expanding your operation. What you don’t want is to have to worry about getting your checks covered on payday. FirstBank has many solutions to ease this pain! All you need to do is let us step in and set your business up for success. We know that every business experiences unique challenges in their cash flow cycle, and we have services to help you all along the way! Here’s a quick-hit of some ways your business can gain efficiency and add some extra gold coins to that beautiful money bath. Receiving Payments: If you want to get paid faster, clap your hands! 🙂 Just kidding, but really we’ve got some tricks up our sleeve. Merchant Services: We offer a variety of options when it comes to accepting credit and debit cards for payment. What’s better than same-day credit in your account? That’s about as close to real-time cash as you can get. ACH payments: If you want to set up automatic payments to pull directly from your customer’s bank account, we can help! You can set up batches for payments within Internet Cash Management. Remote Deposits: You’re not alone if you think it’s a pain to find the time to physically go to a bank to deposit your checks. Whether you want to make a deposit from your phone, a flatbed scanner or with one of our speedy check scanners in your home or office, we have a solution for your remote check depositing needs. Lockbox processing: If you receive a large number of check payments throughout the month and want a more efficient way of processing these deposits, lockbox may be a great option for you. Your customers can send their check payments to a P.O. Box that FirstBank sets up and maintains in your name. We’ll process all the incoming mail and make the deposits into your business account, without taking a minute of your time. Sending Payments: No one wants to see money leave their bank account, but that’s just the way the world works. We have solutions to help simplify this process. Business loans: We have a wide variety of options when it comes to funding your business. From revolving lines of credit, to SBA loans, to commercial real estate, we have a wide range of expertise in funding the businesses of all sizes in our communities. ACH payments: Automated Clearing House payments are an excellent option if you want to simplify your payroll processes, easily make tax payments, or debit your customers’ accounts directly. This is also a great option for eliminating paper payments making a “greener” operation. Wire transfers: Our online wire transfer system allows you to send domestic wires from anywhere your business takes you. Bill Pay: You no longer need to visit every biller’s website to make online payments! Let our Bill Pay system consolidate all your bills into one, convenient payment portal. Purchasing/Procurement cards: Our business credit card management tool may be the perfect way to simplify your accounts payable process. If you have multiple employees making company purchases, our “P-card” system can ease the headache of constantly cutting reimbursement checks. You can manage cards(add and delete cardholders, order new plastics, set spending limits, view transactions, dispute transactions, make payments, and more) while also streamlining transactions to work with your specific accounting needs (customized ledger accounting, cost allocation codes, add receipt and invoice images to transactions, and track approvals for purchases). Online transfers: Easy access to make transfers between business accounts, separate business entities, and between business and personal (not always ideal, but sometimes necessary). Reports: Our reports are one of the most powerful tools available to give you insight into your business’ operating cycle. We have customized reports for everything from broad account summaries to in-clearing checks to ACH and Wire details. Positive Pay: This is a powerful fraud tool to protect the check payments coming out of your account. Just send us a list of details about the checks you have issued (including date, check number, amount, and payee name) and we will reference this list to the checks that are submitted to your account for payment. If any of these items differ from what you have sent us, the item will require your review before payment. Cash Concentration (Sweep Services): This is an automated account setup that eliminates the need for you to make daily decisions in monitoring balances and moving money. You’ll get the most bang for your balance because your surplus funds will be automatically transferred into a higher interest Liquid Asset account. Each of these products and services are made to make your life easier and make your business run with the efficiency of the Six Million Dollar Man in his prime. If you want to have your business evaluated to see which of these services may best fit your operating needs, call us at 877-249-9980, email us at business.services@efirstbank.com, or go into any branch to speak with a banker today!